This is my third day of writing about Glastonbury's Chalice Well - and for those of you who aren't so keep on the landscaped gardens that are home to the sacred spring, I promise it will be my last post about the subject for some time. But, before moving on, I wanted to post the last two pictures I took when I visited Chalice Well last weekend and also talk about the two legends that most fascinate me about this site - the Goddess and the Grail. Chalice Well is a natural spring and has been in use for at least two thousand years and, like many ancient springs in Britain, it is thought to have healing properties and is also associated with the Goddess or with the female aspect of deity. 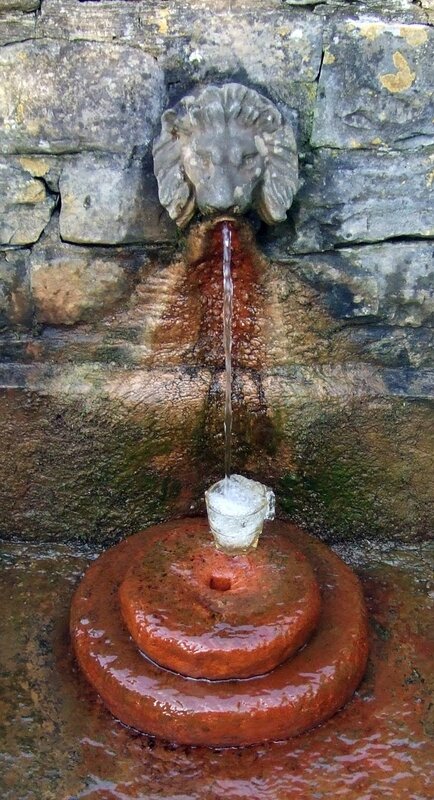 Water as an element is connected with the feminine and the reddish colour of the water at Chalice Well, caused by its high iron content, has been likened to the red of menstrual blood or the blood spilled in childbirth. There are many feminine symbols and goddess images placed around the well. A statue of a mother and infant - perhaps Mary and Jesus or Isis and Horus - stands in a small shrine; the cover of the well head is decorated with interlocking circles, called the vesica piscis, which some believe represents the yoni. The channel through which the waters pour into a pond on the lower lawn also looks quite yonic. Male symbols are present too - the sword or lance that intersects the vesica piscis and the small pillar with its curved head below the yonic waterfall look decidedly phallic to me. 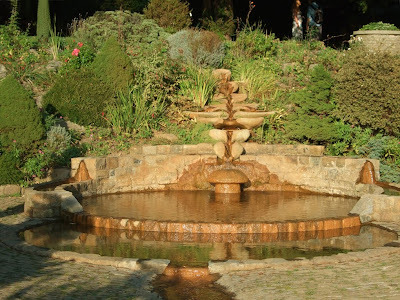 But, overall, the Chalice Well and its surrounding gardens seem more of a feminine sanctuary with quiet, restful energy away from the busy world outside. The Grail came to be associated with the Chalice Well through the Christian legend that Joseph of Arimathea brought the cup that caught Christ's blood at the Crucifixion to Glastonbury and hid it in the well. However, many pagans associate the Grail with Celtic legends of a magical cauldron that can bestow knowledge, heal wounds and even offer the gift of rebirth. Most stories of searches for the Grail suggest that the seeker must prepare themselves mentally and spiritually before they are ready to even glimpse the sacred cup. If you feel you are on a Grail quest - or just want to visit those places associated with the Grail - Chalice Well would be a good place to start. Spend a little time meditating there and, if you are lucky, you could be granted a vision to guide you on your path. A book about the history of Chalice Well is on sale, called Chalice Well: The Story of a Living Sanctuary. Vivienne - That's OK! I don't normally post three lots of pictures on the same topic three days in a row and I was concerned people would be getting bored with them.